On this blog, I currently have two running series I’m doing: “Reflections on Repentance” and “Women & the Church“. For these series, I’ve been doing a lot of reading and research on those topics. For the Women in Ministry series, I’ve been researching what, for me, is the biggest thing that gives me pause in my own egalitarian view in support of female pastors: the complete dearth of women leaders throughout the history of the whole Christian church. With a couple thousand years now of godly men (and women) looking at the same Scriptures I am, why have the vast majority of them come to the same view limiting women’s role? Well, that’s another post for another time, but rest assured, as I’ve been researching this, I feel I’ve satisfied my concerns in this area. But that’s not what this (mostly tongue-in-cheek) post is about. 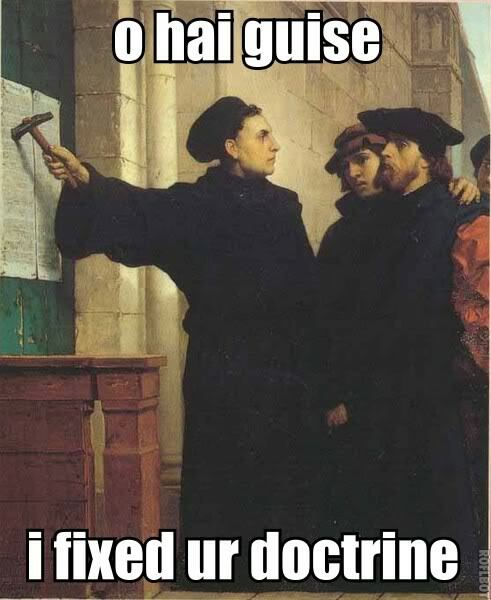 Martin Luther posted his 95 theses to the door of the castle church of Wittenberg in 1517 A.D. We start seeing a very Catholic-sort of church hierarchy, structure, and practice developing in the Christian Church around 200 A.D. And so, one could say that the Church errors which the Reformation sought to critique were going on for roughly 1,350 years before they were noticed and change (which I feel was good) started entering into the Church. I don’t want to give away too much now (we’ll save it for a couple of other posts later), but it seems like women were actually thriving as leaders in the early church until about 500 to 600 A.D. It seems to me, then, that the Christian Church is ripe for a new Reformation, but one centered around female Church leaders and Women’s places in the Church. Looking over the course of Church History, other than the earliest days of the Church, this present day seems to be the most open to change in this area. There are more women preaching, leading, serving, and teaching now than there ever has been since this move around 600 A.D.
Maybe you look around and think that egalitarianism is still far too much in the minority to be true. If that’s you, I’d tell you a few things. First, it took hundreds of years before Reformation thought reached “convincing” levels. Second, there are still more Catholics in the world than all of the global Protestants combined. And lastly, we’re still less than 500 years since the Reformation–that’s less than a third of the time we think Catholics were “getting it wrong”. Are the the winds of a new Reformation blowing? Perhaps. Will you be a Luther, or will you try and lead the couter-attack? History is watching.